How do you feel about the "Trump Hotels" brand? How about Fox News or The Washington Post? The answer is that it very much depends on whether you're a Republican or a Democrat. A new survey from Morning Consult, a polling and data analysis company, found Trump Hotels to be the most polarizing brand among Americans, with a 78-point "net favorability spread" between Democrats and Republicans. After that, it's quite a list of media companies: CNN, Fox News, NBC News, New York Times and MSNBC round out the next six. 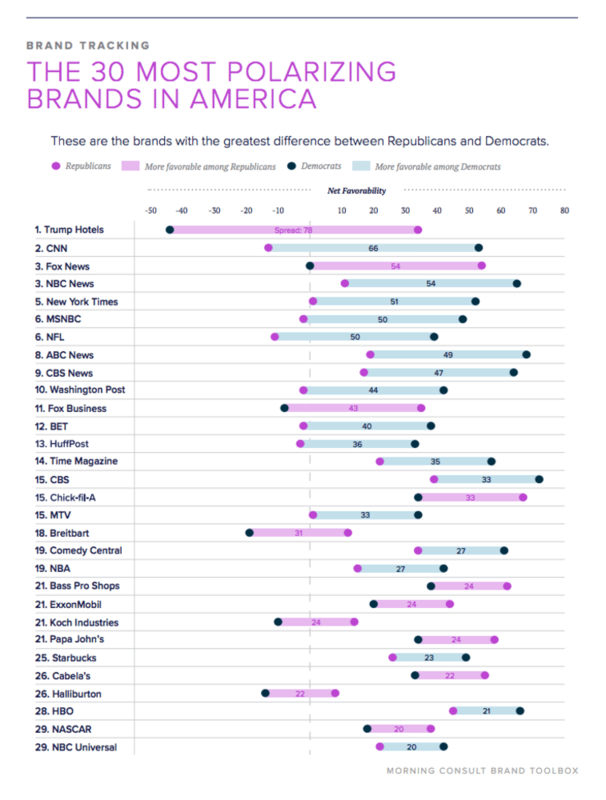 The survey, which was based on 336,370 surveys conducted online by Morning Consult from Oct. 3, 2017 to Jan. 2, 2018, highlights just how politically divisive the media has become, with Republican and Democrats disagreeing deeply about how they rank the favorability of many mainstream outlets. The chart below, via Morning Consult, illustrates just how different the two sides see many major U.S. news outlets.